Etude was written in the artist’s hometown, in a typical open-air, rich in cool green shades. The artist reveals the poetry of everyday life in the corners of the provincial city. Saratov, standing on the Volga – a sunny and windy city. This determined the artistic task of Borisov-Musatov. A dynamic sky, covered with clouds of fuzzy outlines, a tree bent under a gust of wind, risking losing its crown, clear, living rhythms are created by diagonals of smooth colored roofs. Inanimate and too unexpected for the artist the landscape is filled with the inner life of movements and rhythms. 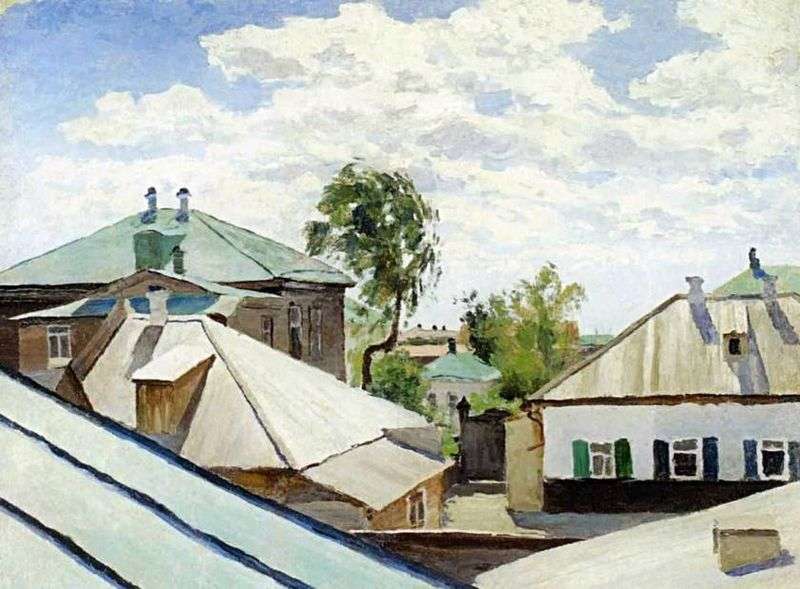 Description and meaning of the painting Roofs by Victor Elpidiforovich Borisov-Musatov.